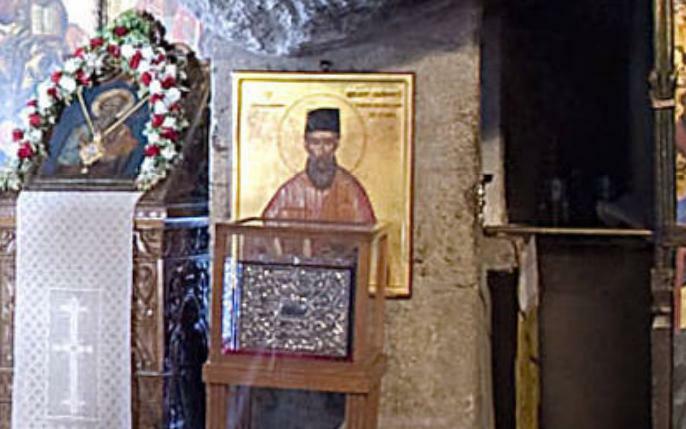 St. Makarios Kalogeras, the Teacher of the Nation, was born on Patmos in 1688, and was from a wealthy family. Later he went to Constantinople for studies and came into contact with noteworthy families and clerics of the Queen City. 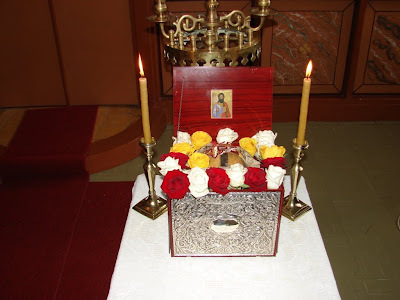 After many years of study he became a Deacon with the Metropolitan of Nikomedia. As St. Makarios placed great significance on the teaching and raising of the Greeks under oppression of the Turks, he returned to Patmos, and in 1713 he founded the Patmias School. The lessons at the school were offered free to all students and in the beginning St. Makarios taught by himself. After a few years, the best students were selected as teachers of the school. These students were from Patmos and other areas under the Ottoman Empire. His chief co-workers were monk Kosmas from Lemno and St. Gerasimos Byzantios. The number of students increased to 100, and because of this they thought there was a need to create more buildings, which occurred through the help of generous gifts from Constantinople. The Patmias School became one of the most significant schools of Hellenism. St. Makarios, who was weakened by an infection, reposed on Patmos in 1737. His name lives on through his intense activities and his work. His Sacred Service was never beyond the depth of the Deaconate, because he was much more pleased, as he said himself, to serve instead of being served. For a more complete biography in Greek, read here. To read one of the books of St. Makarios in Greek, see the work titled "Evangeliki Salpynx" which is a book of lessons on the Gospel readings for the entire Ecclesiastical year. Read here. 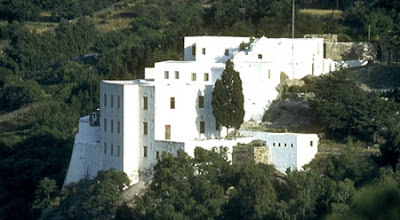 The Theological School of Patmos was founded by the Hierodeacon Makarios Kalogeras in 1713 AD and is situated on the hillside directly above the Cave of the Apocalypse. The school is a spiritual legacy of St. Christodoulos of Patmos who included it in his original plans for the island of Patmos; Emperor Alexios I issued a deed of title in which he mentions it to be "an abode of learning where local disciples will gather." 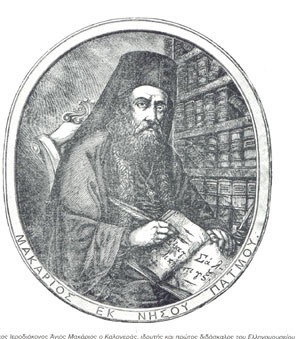 Makarios studied theology and philosophy at the Patriarchal School of Constantinople. He was supported by many well-known families such as the families of Mavrokordatos, Ipsilantis, as well as the Metropolitan of Nicomedia, who saw him as his successor. However, Makarios loved his teaching and he returned to Patmos in 1713 and created the School in the Cave of Apocalypse. His consultants and supporters were scholars of the nation and Emanuel Ipsilantis was one who supported the project financially. He built a few cells there for himself and his few students. The reputation of the School began to spread and very soon there were students arriving not only from the neighbouring islands, but also from Peloponnese, Athens, Bucharest, Asia Minor and Russia. These crowds of students arriving forced Emanuel Ipsilantis to build more cells. At the beginning, Makarios taught by himself. However, soon he began to receive help from his senior students. His student Gerasimos of Byzantium became his friend and co-operator, who continued the work after 1737, when Makarios died. In 1769 the School was reformed into a "General School of the Nation" by the Ecumenical Patriarchate, similar to a small private college. Its reputation was excellent, and in 1731 when Fr. Basil Gregory Barsky visited from Kiev, he wrote, "For the Greeks who are under the Turkish yoke, this school took on the significance of ancient Athens." That the School played a role in the revival of the Greek nation is undeniable. Among its graduates are numbered Emmanuel Xanthos, one of the founders of the "Society of Friends" which worked for the liberation of Greece. More importantly, the founder Makarios Kalogeras, and two of the graduates, Gerasimos Byzantios and Daniel Karamares have been canonized as saints. The course of the School of Patmos was extremely hard in the years to come. From 1902 it began to operate as a hieratic school and in 1907 it was forced to move to Samos due to financial problems. In Samos it continued to operate successfully only for a few years and it later closed down. Its activity continued after the liberation of Patmos in 1947. This is when it was rebuilt, only a few meters away from its old location. The Patmos School is today a training school for young men throughout Greece taking in students from twelve years of age through high school, giving them a regular school curriculum, but concentrating on subjects such as church history, dogma, theology, and Byzantine chant. Young men who want to become priests can study a few additional years and be ordained without taking the full course of theology at the Theological Academy of Athens. These schools are often attended by priest's sons (who themselves frequently become priests), boys interested in monasticism or simply those whose pious families want them to have the benefit of a church-oriented education. The official website of the school can be seen here. A blog for the school is here. 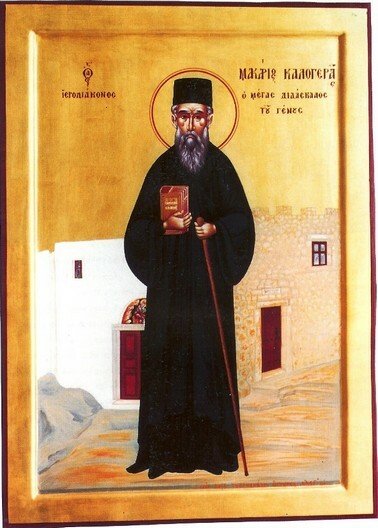 The pride of teachers, the boast of deacons, the glory of the island of Patmos and the adornment of monastics, let us honor Makarios, O faithful, in hymns and spiritual odes towards him in reverence harmonically saying and crying out: Glory to Christ Who glorified you, Glory to Him Who magnified you, Glory to Him Who showed you forth as our protector in these last days.